Burning Vision is a play in four movements, taking place on the clock-like stage divided into four quadrants and tracing the journey of uranium through four locations, in four nations, and through the four elements: from the lands belonging to the Sahtu Dene First Nation in Port Radium, Northwest Territories; to the fires in the refineries in Port Hope, Ontario; across the waters in ships to Los Alamos, New Mexico; and finally into the air in the form of the bomb that dropped on Hiroshima and Nagasaki in 1945. Each leg of this traverse implicates the people who live there and connects them to one another, whether they are aware of this connection or not. In this literary analysis, we will examine one of the ways that Clements plays with theatrical conventions to stage these connections across characters and histories. In Clements’ play, many of the characters have doubles, and as the actors move from one role to another, the audience becomes aware of how fortuitous bonds between individuals and communities become established through the accidental collision of large-scale historical events—from the Pacific War, to Japanese Canadian internment camps, to Indian residential schools, to the history of resource extraction in Canada. This theatrical convention of character doubling is one that writers cannot readily replicate in print genres. 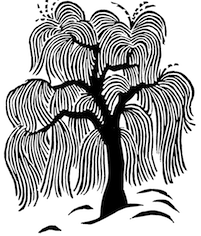 For example, the Grandson Koji, who may be the son of Koji and Rose, is raised by the Dene Widow, who is a double cast with the character of the Japanese Grandmother. 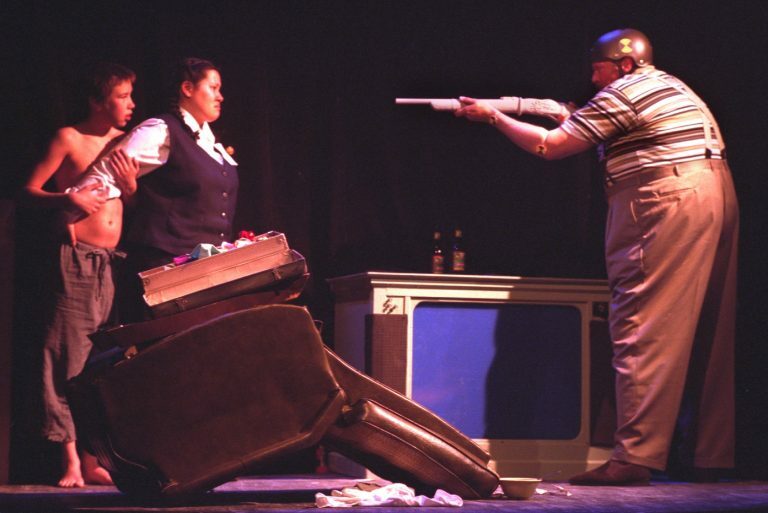 Fat Man (Allan Morgan) confronts Round Rose (Julie Tamako Manning) and Little Boy (Nathan Dubois). Photograph by Tim Matheson. Reproduced with permission from Rumble Theatre and Urban Ink Productions. The part of Koji the child is played by the same actor as Little Boy. Little Boy himself seems to represent more than one character. In the notes on the characters at the beginning of the play, Little Boy is described as “[t]he personification of the darkest uranium found at the centre of the earth” (Clements n. pag.). Along with the uranium ore, Little Boy is shipped from Sahtu Dene territory to the nuclear test site in New Mexico where, displaced from his family and ancestral territory, he becomes Fat Man’s adopted Indigenous child. With Round Rose (who is based on Iva Toguri, a Japanese American university student coerced by the Japanese government to play the role of the radio personality, Tokyo Rose, and later tried for treason by the American government), the three characters become a ‘nuclear’ family. “Little Boy” and “Fat Man” are the code names of the atomic bombs dropped by the United States on Hiroshima and Nagasaki, respectively. Little Boy simultaneously becomes the “child” of the Dene Prophesy. Fat Man is also a nuclear test dummy, who is waiting for the atomic blast in a plywood house in the desert in New Mexico, with his companions Little Boy and Round Rose, whom he considers “enemy aliens,” the same label the Canadian government applied to Japanese Canadians. In closely linking Koji, Little Boy, Round Rose, and Fat Man, Clements is creating uncanny echoes between Japanese, Ainu, Canadian, Dene, and Métis histories. Through the theatrical convention of actors doubling, Clements draws our attention to complicated historical relations and how we are positioned within these histories. The importance of shared responsibility is reinforced powerfully when the Dene See-er announces that “The people they dropped this burning on, [they] looked like us, the Dene” (119). The play uses this moment of recognition to raise provocative questions about how we are implicated within, and perhaps even responsible for, each other’s histories. As Theresa May observes, in the play, bread is a recurrent symbol. For example, Rose is a breadmaker and at one point, she gives us the recipe for her father’s bread that they sell at the H.B.C. (Hudson’s Bay of Canada) store. Rose also describes herself as a “perfect loaf of bread” and as having “a tender, golden brown crust which can be crisp, or delicate” (58). What are some of the ways that the various images of bread can be interpreted? Round Rose, Fat Man, and Little Boy form a “nuclear family” that falls apart. How are notions of family revised in this play? Why are these new understandings of relationality important? Another theatrical convention that Clement engages with is sound. Towards the end of the play, the characters listen to the sound of Rose’s unborn baby’s heart beating (109). This is also the sound of radium-painted clocks ticking. What is the significance of radium acting as both a force of life and a force of death in the play? May, Theresa J. “Kneading Marie Clements’s Burning Vision.” Canadian Theatre Review 144.1 (2010): 5-12. Print.